Keep up to date with the local and overseas dog scene. This blog is set up to keep dog lovers informed on what is happening on the island and overseas. It may feature local dog shows and training results and other topics which may be of interest, overseas and locally. As in most blogs, you are reading a blog owner’s opinion on posts. Please note that you need to register first if you wish to comment on any of the posts. You are then free to log in and post. This is a moderated blog and if you are a spammer I will not even see your post as the blog has spammer protection. To date, 2016, I have made up 10 Bouvier Des Flandres Champions in the show ring. These Bouviers were all owned by me and carried my registered kennel prefix Calliope. One of my Bouviers, Ch. Calliope Rhapsody C.D. out of 2 of my imported dogs, Ch. Farleycross so Far So Good (UK) and Ch. Rick Lois From the Dogsfarm at Calliope (the Netherlands) has won just about everything in the show ring. She was bred, trained, groomed and handled by me. She has won several working dog and reserve working dog groups, reserve best in show, best in show, along with several best locally bred in show and the B’dos. Kennel Club’s annual award for the Best Locally Bred Dog in Show. She also achieved the C.D. (Novice) obedience title. Besides their show achievements, I have achieved 6 CD (Novice level obedience) titles with Bouviers. The Tibetan Terrier also has a C.D. title and both Ch. Araki Miss Conduct at Calliope C.D and Ch. Chepam Valentina at Calliope, C.D. are working for CDX titles. My Bouviers have also enjoyed agility. There are no agility titles in Barbados so it is just a fun sport. In 2011, I imported (from the UK) a 13 week old Tibetan Terrier, “Tibby”. She is now made up as a Champion. She achieved 2 (out of 2) Best Puppy in Show and also won the Utility Group while still a puppy. She also has a C.D. title. In 2014, Chepam Valentina at Calliope, (Isabelle) arrived from the UK. She was 12 weeks old. She was made up as a Champion early in 2015 and before she was 2 years old, she achieved a C.D. title and also the FCI recognised BH title. In conformation dog shows, she achieved 2 out of 2 Best Puppy in Show, 2 Working Group Reserve wins, and a Challenge Certificate for every show she has entered. The Working Group in Barbados is regarded as a competitive group again with usually 11 breeds. 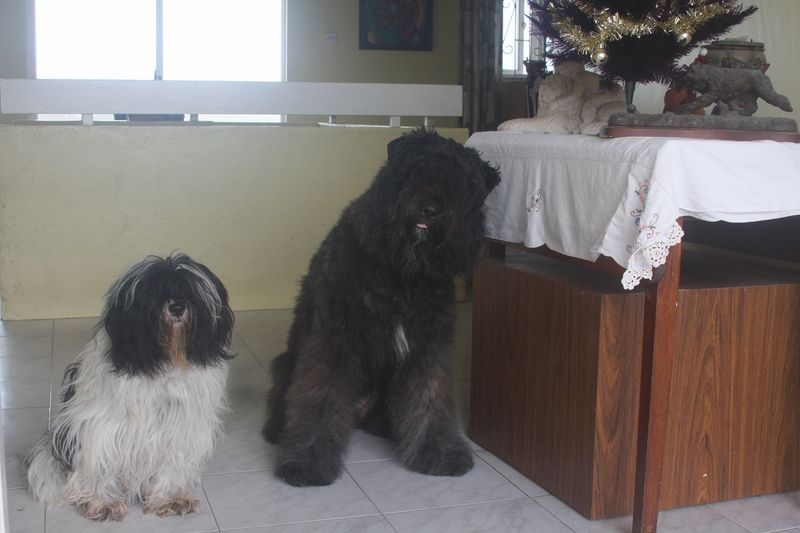 Early 2016, in the below pix., are the Tibetan Terrier “Tibby” and Bouvier Des Flandres, “Isabelle”. Copyright © 2019 Dogs In Barbados All rights reserved. Blue Grace theme by Vladimir Prelovac.